In order to offer better services, Perutnina Ptuj company decided to change its operations – wanting to achieve a quicker response to market demands and provide conditions for growth. They needed an environment that would provide them with the marketing of services and products without internal conflicts and coordinated contact with existing and potential customers, regardless of the used sales channel or partner. The answer to their problems was the digitization of field processes. They decided to launch a mobile support. Based on the good experience of the company Pomurska mlekarna and following the example of good practice of digital transformation, they decided to introduce MSP (Mobile Service Platform), which Telekom Slovenia offers as a cloud service. This platform offers a better overview of operations, a faster flow of data and a faster response. It provides better coordination of field activities and better utilization of available resources. In cooperation with Telekom Slovenia, i-Rose has developed a Mobile Service Platform (MSP). It allows the user to access information from the office and vice versa, provides document management and better communication. The tool is useful for field processes in all business branches and is adapted to the business processes and the nature of the individual company. 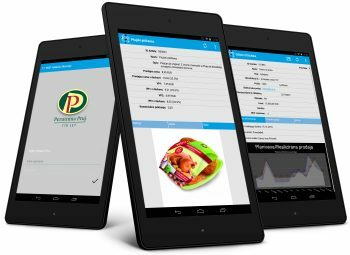 The user can access the data from a back-end system via a tablet or smartphone. Perutnina Ptuj will achieve an improvement in the incidence on different points of sales with the implementation of MSP. They will have quality data about inventories, the state of shelves in stores and records of activities that will be used to negotiate with dealers. Having real-time information and greater bargaining power will also reduce the amount of time spent on marketing activities. The expected saved time is supposed to be 8 hours a week per employee, who has until now used paper forms and reports on the field and entered them into the system manually. With relevant information, they will optimize the team’s performance in the field and improve its productivity. They are estimating that the level of efficiency will rise by 30%. At the same time, they believe that the investment in mobile support will be repaid in about six months.